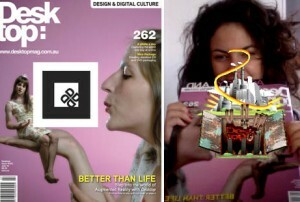 Desktop July issue: Augmented Reality special! CLICK HERE TO PLAY WITH THE COVER! It’s the hologram of the future – today! Augmented Reality (AR) is the craze sweeping the nation that perhaps hasn’t swept you off your feet just yet – but that’s all about to change with the release of the very special July issue of Desktop magazine. Sitting in the centre of the front cover of Desktop’s July issue you will find what is known as an Augmented Reality ‘Marker’ – a square box with a simple symbol, or pattern inside it. This has been set up to trigger your AR interaction. In order to activate this very cool experience you simply go to a designated online portal (located at www.desktopmag.com.au/ar) where you will find instructions on how to use the marker by holding it up in front of your web cam. The marker then springs into life, instantly replaced by a Desktop inspired animation courtesy of the talented folks over at Boffswana. “As you hold the marker up to your computer, a trapdoor will mysteriously appear on the cover of your copy of the July issue of Desktop magazine. You’ll see this on your computer or mobile screen. Slowly the trapdoors then open to reveal a set of mechanical arms, which spring into action to pull something out from the space below… but what is it? That’s for us to know and you to find out!” states Desktop’s Managing Editor, Jo Spurling. Cool! Looking forward to having a play once I get my copy! Very cool! Tis the way of the future! This is fantastic… Who can provide this kind of service? Love the idea and Especially the cover!